You might consider a visit to Mérida, on a holiday in Andalucia, a bit strange. Because Mérida is NOT in Andalucia. 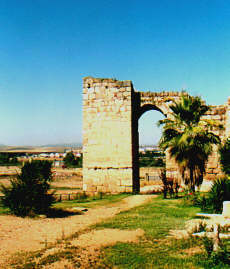 Mérida lies in Extremadura, just north of Andalucia. Some of our friends were in Mérida a few weeks ago, and they really liked it. This was one of the reasons we wanted to see the city. 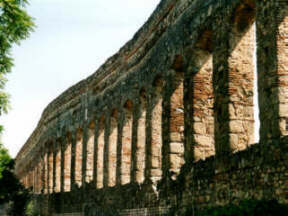 The other reason was we enjoy aqueducts. And Mérida has two of them, dating back to Roman times. 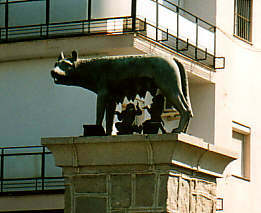 The city has a lot of other Roman remains, a bridge, a theatre, an amphitheatre, and a racing track for horses. 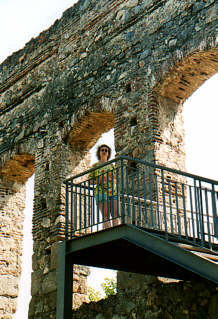 It has also a castle, of which this arch is a small part. 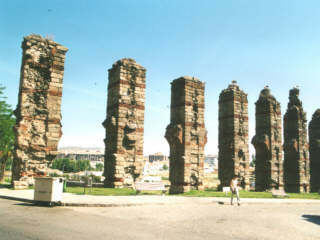 These columns are part of the old aqueduct. We are here in stork-territory: on every column is a stork nest. In large parts of the region storks can be found: on churches and other things that are higher than wide. Electricity posts for example. We even saw an electricity post with three nests: you could call that a stork flat. The other aqueduct is in better shape. We suspect it has been restored, as it stretches for at least 1 kilometer and it looks perfect. Steel stairs allow you to cross the aqueduct without damaging it. Strangely enough there are no parking places for touring cars. Not popular enough ? In the museum we should have found about this, but we didn't feel like museums at the time. 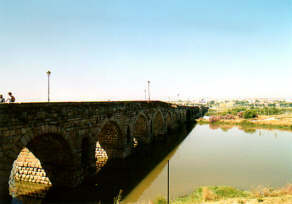 The roman bridge crosses the Guadiana. On the other shore you can just see the pink oleanders. When we were in Mérida, every shop (including those selling postcards) was closed. And it was not siesta-time, or a Sunday. 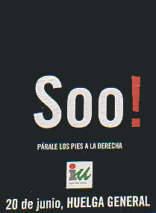 Later we found the reason: there was a general strike, because the EU-top had a conference in Spain and some of the proposals were not OK. A statue for Romus and Remulus in Mérida? It appears that Rome is a twin town of Mérida. Then, why is it called Mérida instead of "Remele" ? Not Mérida itself, but a little to the south. This recent made reservoir made a good spot for our lunch. There even was a brand new park, with a bench for us to sit on. 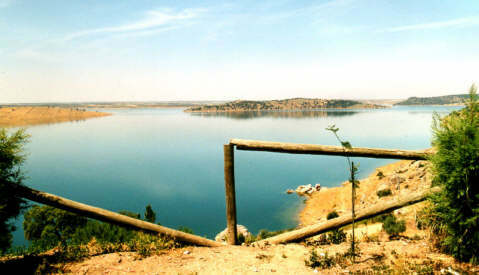 The reservoir is not so recent that the gates are not broken. But who cares.